Space Center Houston has set Jan. 23, 2016 for the launch of its new $12 million Independence Plaza. Space Center Houston, which serves as the visitor center for the NASA Johnson Space Center, has announced Jan. 23, 2016 as the opening date for Independence Plaza, its new $12 million complex featuring a full size replica of the shuttle orbiter mounted on top of the historic first Shuttle Carrier Aircraft (SCA). The date's announcement on Wednesday (Aug. 12) came 38 years to the day after the SCA, a modified Boeing 747 jetliner, released at altitude the prototype Enterprise on its first approach and landing test in 1977. During the SCA's three decades of service, the plane (also known by its tail number, NASA 905) ferried orbiters piggyback 223 times. NASA 905 now permanently carries the high-fidelity mock shuttle Independence, creating the world's only display of an orbiter mounted atop an SCA and the only place where the public will be able to enter both. The jumbo-sized complex will give visitors a glimpse into the historic shuttle era and the NASA advances gained as a result of the 30-year shuttle program, which has helped to shape the future of space exploration. An elevator tower, now under construction, will first take visitors to the top of the exhibit to enter the Independence using a timed ticketing system. Once inside, guests will tour the shuttle's flight deck, where they can see how the astronauts piloted the orbiters through 135 missions. One floor down, visitors will see how the crew members lived and worked on the mid-deck and then can walk out into the 60-foot-long (18-meter) payload bay to see a flown cargo carrier from the maiden flight of the space shuttle Endeavour in 1992. Down one more level, visitors enter NASA 905, the largest artifact from the shuttle program to go on public display. Here, guests will explore seven exhibit areas dedicated to different aspects of the shuttle's development, as well as the aircraft that was modified to carry it. At the front of the plane, the public will learn about how the shuttle was designed. In addition to information about Johnson Space Center's role in the vehicle's development, guests will get hands on access to one of the thousands of thermal protection tiles that lined the shuttle's exterior body and be able to heat one side of it to feel how cool it stays on the reverse. The steel for the elevator tower is now going up for Space Center Houston's landmark Independence Plaza. Continuing through the aircraft, guests will see the actual radio-controlled flying model that was used in the 1970s to convince NASA that mounting a shuttle on an aircraft was an idea that could work and learn the history of how the 747 was retrofitted to mate with the orbiter. 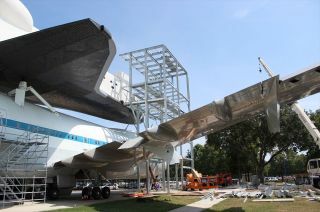 Visitors will be able to perform stress tests to see what materials served to support the weight of the shuttle as designed and then ascend a staircase to view the aircraft's cockpit. The next exhibit area will give guests the opportunity to practice mating and detaching the shuttle and orbiter in an interactive display before viewing a movie highlighting the shuttle program's innovations. They will then move into a section memorializing the fallen Challenger and Columbia crew members. Finally, visitors will have the chance to learn more about the creative thinking that went into the development of the space shuttle and the SCA, as well as how those types of innovations are still applied to the projects being worked at Johnson Space Center today. Supporting Space Center Houston's educational mission, the exhibits will also emphasize problem-solving concepts and career paths in science, technology, engineering and mathematics (STEM). The attraction will honor those who designed, built and flew during the space shuttle program by sharing stories from astronauts, engineers and pilots. The complex will host educational programs and events in and around the aircraft. The exhibit is the biggest project for the non-profit Space Center Houston since it opened in 1992. See the exhibit plan for inside the Shuttle Carrier Aircraft, part of Space Center Houston's new Independence Plaza, at collectSPACE.com.